Adults and youth starting at 15 years of age. Leave the beaten path and crowded pistes behind and descend virgin slopes and gullies of glittering snow, discovering landscapes known by a few. For the more daring the ascend can be done not only by skins but also by helicopter. Remember that heliski can be practiced in only a few zones in the Aosta valley, dedicated to: Valgrisenche, La Thuile, Cervinia, etc. 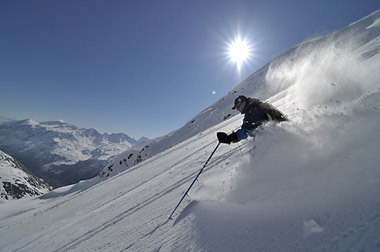 It is necessary to possess the ability to ski safely on level “red” pistes. Gore-Tex jacket and pants, Windstopper jacket, Crew neck shirt and t-shirt of breathable material, pants of special elastic fabrics (no jeans), eventual tights, sunglasses with UVA and UVB protection, hat and warm gloves, thick socks of wool or special synthetic material (no cotton).